It's different for everyone. For some, the signs of spring blooming in Victoria are definitely making people happy. For others, it's having family close by. For the loveable underdog Charlie Brown, "Happiness is a warm puppy." After 60 years, the charm of Charles M. Schulz's classic characters and the timeless honesty of his messages still resonate—maybe even more so — with kids and adults today. The message is pretty basic: Happiness is found in the simple things in life... so let's not forget to enjoy them! Read on for an interview with the director Fran Gebhard that ran in Island Parent Magazine, our alumni updates, related events and more. Behind the Scenes: Good Grief! Charlie Brown is back - but is he still relevant? You just can’t keep a good man down, especially when he’s as enduring as good ol’ Charlie Brown. But while the majority of parents today grew up reading the late Charles Schulz’s iconic Peanuts comic strip and watching the animated TV specials, the same isn’t necessarily true for our kids. 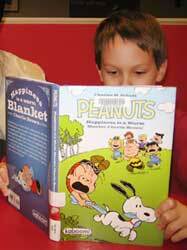 Sure, my own young children know the Peanuts gang, but that’s because I’ve made a point of borrowing the collected strips from the library and exposing them to the specials. (It still doesn’t feel like the holidays until I’ve watched A Charlie Brown Christmas.) Which begs the question, is Charlie Brown still relevant for kids today? Fran Gebhard thinks so. 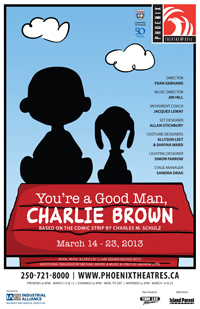 A professor of acting in the University of Victoria’s Department of Theatre, Gebhard is directing the upcoming production of the musical comedy You’re A Good Man, Charlie Brown—which she sees as more than just another nostalgiac flashback parents want to foist on their kids (“but I loved Snoopy when I was your age”). 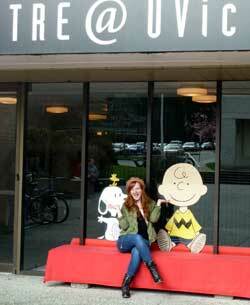 For Gebhard, Charlie Brown is less of a blockhead and more of a potential role model. Not that parents have to worry when they bring their kids to the Phoenix production. 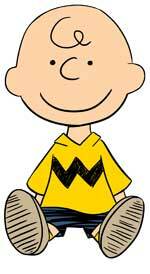 A two-time Tony Award nominee on Broadway that was remounted to at Ontario’s Stratford Festival in 2012, You’re A Good Man, Charlie Brown has charmed audiences for over 40 years now. Gebhard also feels it’s a great way to introduce children to live theatre. Yet despite Charlie Brown’s unquestionable impact popular culture—making Schulz the highest-paid and most widely read cartoonist of all time, and earning him a spot in the Guiness Book of World Records for being syndicated in 2,000 newspapers—the question remains: is the Peanuts gang still relevant today? Previews are the rehearsals open to the public two days before Opening Night — for only $7.00! Preview tickets are made available to the public ONLY after 5pm on performance days. Reserve in person or charge by phone. Good grief! A runaway hit on Broadway – twice! 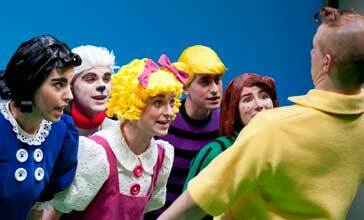 – this loveable ode to Charles M. Schulz’s Peanuts gang is once again enjoying a revival. Follow the antics of good old Charlie Brown as he spends a day pondering the meaning of life. In between kite-flying escapades, baseball games and failed attempts to win the heart of the Little Red-Haired Girl, he finds solace and friendship with Linus, his sister Sally, nemesis Lucy, musical genius Schroeder – and, of course, man’s best friend, Snoopy! Fun for the whole family, set to a singable score that was nominated for the Grammy for Best Musical Show Album – twice! April 1 - New Season Announcement! Look for the announcement of our 2013-14 season next month! Information will be posted here after April 1. 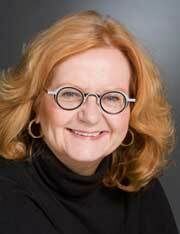 Blue Bridge Repertory Theatre recently announced the casting for their 2013 summer season. Love Letters will feature design consultation by Patricia Reilly (BFA ’10). Uncle Vanya will be directed by theatre professor Brian Richmond with sets and costumes by Nathan Brown (BFA ’09), and will feature alumnus Trevor Hinton (BFA ’07). Amitai Marmorstein (BFA ’07), Sebastian Archibald (BFA ’07), and Kate Richard (BFA ’06) will be performing in Brighton Beach Memoirs, with costume design by Reilly. The season will close with My Fair Lady, with professor Brian Richmond as Henry Higgins. It will also showcase performances by Kholby Wardell (BFA ’08) and Sarah Jane Pelzer (BFA ’09). 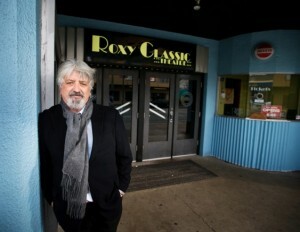 Blue Bridge just purchased the historic Roxy Theatre and has launched a capital campaign to renovate the space for live theatre while currently maintaining the Roxy's presentation of movies. Current student Kaeden Derksen is set to appear in Hannah Moscovitch’s Essay at the Intrepid Theatre Club. Directed by Fringe Festival favorite Julian Cervello, the show looks at feminism and sexism in the world of academia. The show runs as the second half of a double feature with Eugene Ionesco’s The Lesson, March 20-23 and 28-30. David Christopher (MA ’10), well known for his Shakespearean efforts as Artistic Director of Keep it Simple Productions, recently starred in a local filmmaker’s nearly four-year, feature-length passion project. Christopher plays the title character in Matthieu Hallé’s Margraue, a production the 20-year-old director has been working on since his senior year of high school. The film premiered in Victoria on February 21 and was shot mostly within the city. Jessica Wong (BFA ’12) and Bryan Kenney (MFA ’12) are currently creating the sets and projections, respectively, for Pipedream Theatre Project’s production of Stephen Sondheim’s Assassins. The show runs from April 3-13 at the Performance Works Theatre in Granville Island. Wong has also recently designed costumes for The Autobiography of Jane Eyre, a YouTube series that features fellow alumni Alysson Hall (BFA ’12), Shaan Rahman (BFA ’11), Patricia Trinh (BFA ’11) and Angie Lopez (BFA ’12). Mika Laulainen (BFA ’12) is set to direct Andy Garland’s Sea of Green, the 2009 National Uprising Playwriting Competition winner. The play, inspired by the 2009 Iranian election protests, examines democracy, injustice and revolution. Laulainen’s production of the show runs May 15-18 (at The Cultch’s Historic Theatre) as part of Up in the Air Theatre’s rEvolver Festival, and was produced by Star Star Theatre. Current students Amy Culliford and Colin Doig have been hired by Walt Disney World in Florida for their International College Program, which runs for the summer. Over twelve weeks the two Phoenixers will be housed on the resort, work in entry-level positions, and have the opportunity to take special business classes and workshops through Disney. Doig will be working in Costuming, while Culliford will act as a costumed character performer. 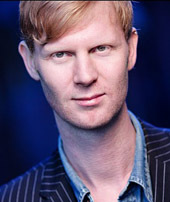 Amiel Gladstone (BFA ’94) recently directed Do You Want What I Have Got? A Craigslist Cantata at Toronto’s Factory Theatre for the Acting Up Stage Company. The show, which Gladstone directed in its original incarnation at Vancouver’s PuSh International Performing Arts Festival, dramatizes real Craigslist ads as a piano-accompanied evening of cabaret performance. Gladstone will be returning to Victoria this summer for the premiere of Smalltown: A Pickup Musical, written by Gladstone and Lucas Myers. This presentation by Theatre SKAM (of which Gladstone was one of the founding members in 1995) will tour parks in the capital region this summer. Current students Cecilly Day and Keshia Palm will be ensemble members in the upcoming Victoria Operatic Society production of Miss Saigon at the McPherson Playhouse in May. 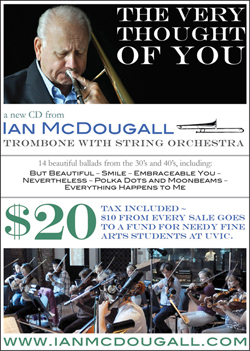 Jazz Trombonist Ian McDougall (Victoria College ’56) was recently nominated for a 2013 Juno for his album, The Very Thought of You. Ian was formerly the Chair of the Theatre Department. Ten dollars from every album sale goes to a fund for needy Fine Arts students at UVic. This album is available for purchase in the Phoenix Theatre Box Office. Roland Schimmelpfennig’s The Golden Dragon, Theatre Inconnu’s next production, is set to feature a selection of Phoenix faces both past and present. The show, directed by Clayton Jevne (BFA ’85, MFA ’87 and PhD ’03), will include Jevne on stage alongside current student Blair Moro, former student Catriona Black, and retired instructor Bindon Kinghorn. As the department’s longtime Theatre Manager and Production & Management instructor, Kinghorn directed and acted in many productions, most recently Rookery Nook in his farewell year. The Golden Dragon opens May 3rd, and promises a dreamlike, kaleidoscopic, tragi-comic tale of globalization. Alumni Peter Carlone (BFA '08 and half of the sketch comedy team Peter 'n Chris) and Mack Gordon (BFA '07) have applied to be on the first-ever Canadian edition of The Amazing Race, and you can watch their hilarious audition video here. The cross-Canada version of the race-around-the-world reality show airs later this year on CTV. Alumna Melanie Karin (BFA '08) and current student Jasleen Powar are in the running for MuchMusic's VJ Search. The top entrants will compete in Toronto to become MuchMusic's newest on-air personality! You can vote for Melanie here and Jasleen here. Win tickets to any show in our 2013/14 season at Phoenix Theatre. Like us and post your answer on the University of Victoria Phoenix Theatre Facebook site to win! Correct answers will be entered into a draw to win a pair of tickets for any show next season! Including: For Good Measure, People's Compounding Pharmacy, Pepper's Foods and Smugglers Cove Pub.